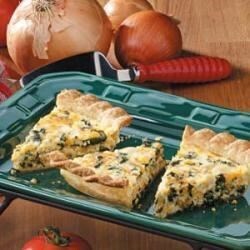 "This delicious quiche features chicken, spinach and cheddar cheese, but you can use Swiss cheese if you'd like. Field editor Barbara McCalley of Allison Park, Pennsylvania shares the recipe and notes, 'This quiche is easy to prepare and cuts beautifully.'" Sprinkle 1/4 cup cheese into the pastry shell. In a bowl, combine the chicken, 1/2 cup spinach, onion and remaining cheese (save remaining spinach for another use). Spoon into pastry shell. in a bowl, whisk the eggs, milk, mayonnaise, salt and pepper; pour over the chicken mixture. Bake at 350 degrees F for 40-45 minutes or until a knife inserted near the center comes out clean. Let stand for 15 minutes before cutting. I loved this. It turned out beautiful and delicious! Even my husband who says "Real men don't eat quiche!" enjoyed it! This is one of THE BEST quiches I have ever had! Although it had less cheese than I expected, it was excellent. This was a very easy recipe and it turned out great. The only change I made was to add mushrooms.